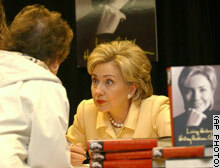 Sen. Hillary Rodham Clinton talks to a book buyer during an appearance Monday at a Manhattan bookstore to promote her memoir, "Living History." NEW YORK (CNN) -- Greeted by fans and a crush of reporters and television cameras, Sen. Hillary Rodham Clinton lamented what she called the "politics of personal destruction" as she hawked her book "Living History" at a Manhattan bookstore Monday. Taking reporters' questions before she met with people who had lined up outside a Barnes & Noble to buy her book, Clinton was asked whether reliving some painful moments from her White House years as first lady -- such as President Clinton's affair with Monica Lewinsky -- was painful. "I think that these were obviously personal and private moments that unfortunately were made public for partisan, political purposes -- a part of the ongoing politics of personal destruction that was so much a part of our country's life and certainly our time in the White House," Clinton said. "I had to address what was public in my memoir, and I tried to do so in a way that might provide some insight and information to the reader." Release of the memoir has been highly anticipated in political circles, fueled largely by leaks of the book reported last week by the Associated Press in which Clinton talked about her husband's infidelity. "This is my story," Clinton told reporters. Publisher Simon & Schuster, has ordered 1 million copies for its first printing, an unusually high number for a work of political nonfiction. And a heavy media blitz surrounds the book. In an interview broadcast Sunday night by ABC, Clinton told Barbara Walters she doesn't have "any intentions or plans for running" for the White House in 2004 or 2008. Asked again Monday about any White House aspirations, Clinton demurred. "That's obviously flattering, but I have a wonderful job I'm very proud to have, which is representing the people of New York in the United States Senate," she said. Clinton, smiling broadly, said her husband had read the book and was "urging everyone to buy a copy and read it." She said he had read drafts of her book and she was doing the same for his, which is expected to be released next year. The book is 528 pages spread over 38 chapters, not counting the acknowledgments and index. The retail price of the hardcover book is $28, while the CD-version is $30. An audio version of the book, narrated by Clinton, runs seven hours on six compact discs. Clinton was paid a $2.85 million advance on the book, part of an $8 million deal. "My eight years in the White House tested my faith and political beliefs, my marriage, and our nation's Constitution," Clinton wrote in her introductory author's note. "I became a lightning rod for political and ideological battles waged over America's future and a magnet for feelings, good and bad, about women's choices and roles," she wrote. In the first 50-pages, Clinton dispenses with her upbringing in suburban Illinois through her attendance at Yale Law School, where she met Bill Clinton in 1970. "He arrived...looking more like a Viking than a Rhodes Scholar returning from two years at Oxford," Clinton wrote. The future president appears with long hair and a beard standing next to Hillary in one of the book's previously unpublished photographs. Clinton in rapid succession covers her eventual move to Arkansas, where the couple married in 1975, his successful terms as governor and his campaign for president in 1992. Only once does she bring up the topic of Gennifer Flowers, who claimed she had a 12-year affair with her husband, which he denied. "He told me it wasn't true," Clinton wrote. "So, let's get back to work," she said she told campaign staffers. Six years later, President Clinton admitted a relationship with Flowers during a videotaped deposition about his affair with Lewinsky. Nowhere in her book does Clinton comment on that. Nor does she address the substance of the sexual harassment claim made by former Arkansas state employee Paula Jones, who claimed that Bill Clinton propositioned her in a Little Rock hotel room when he was governor. The Jones suit was settled in 1998 for $850,000. Clinton's sharpest prose is aimed at the Independent Counsel, Kenneth Starr, who led the Lewinsky investigation and submitted his findings to Congress with a referral for impeachment. "I viewed the independent counsel's assault on the presidency as an ever escalating political war, and I was on Bill's side," she wrote. In her most revelatory account yet of their marital problems in 1998, Clinton said she and the president underwent marriage counseling after he finally confessed his affair with Lewinsky. "As his wife, I wanted to wring Bill's neck. But he was not only my husband, he was also my president, and I thought that, in spite of everything, Bill led America and the world in a way that I continued to support. No matter what he had done, I did not think any person deserved the abusive treatment he had received," Clinton wrote. "I believe what my husband did was morally wrong. So was lying to me and misleading the American people about it. I also knew his failing was not a betrayal of his country," she continued. "If men like Starr and his allies could ignore the Constitution and abuse power for ideological and malicious ends to topple a president, I feared for my country." she wrote. Clinton said the "most difficult decisions" in her life have been "to stay married to Bill" and her subsequent race for the U.S. Senate, which she won in 2000. The book concludes with her departure from the White House two months after that victory. Overnight, approximately 100 people lined up at another Barnes & Noble store on Manhattan's Upper West Side at midnight to buy the first copies. The store stayed open an extra hour past its normal midnight closing time to snag the first sales. Charles Greinsky was the first buyer in line at Barnes & Noble. "I believe in the Clintons," Greinsky said. "I believe in the senator's message." Janie Hsieh, a Columbia University student, picked up 10 copies for herself, family, and friends. "Hillary Clinton is a wonderful role model for young women and I highly support what she stands for and also what she does for our country," Hsieh said. -- CNN Senior Producer Phil Hirschkorn contributed to this report.